NEW YORK, Dec. 3, 2013 /PRNewswire/ — Inspired by the Brooklyn neighborhood and street address that the company is situated on, the new Jay Street Coffee is the latest innovation of the Brooklyn, New York based beverage company-ITO EN(North America) INC. Known for their award-winning signature ready-to-drink teas- TEAS’ TEA, the company continues to expand their beverage offerings by venturing into the new market category of coffee. The new Jay Street Coffee available in Mocha, Latte and Vanilla, is fresh brewed from 100% Arabica Coffee beans roasted to a medium roast, enhancing the sweetness while minimizing any acidity. With a smooth and flavorful finish, the coffee is conveniently packaged in a 16.9fl oz. recyclable PETE 1 bottle. Using milk coming from dairy herds that have not been treated with rBST, the new coffees are ideal for the discerning palate of the busy and active consumer. The colorful bottle designs depict Brooklyn motifs-the famous water tower located atop of ITO EN’s 20 Jay Street building, a historic brownstone window and an iron wrought gate. The three new bottled coffees (Mocha, Latte and Vanilla) are a healthier alternative to the calorie-rich coffees on the market today. 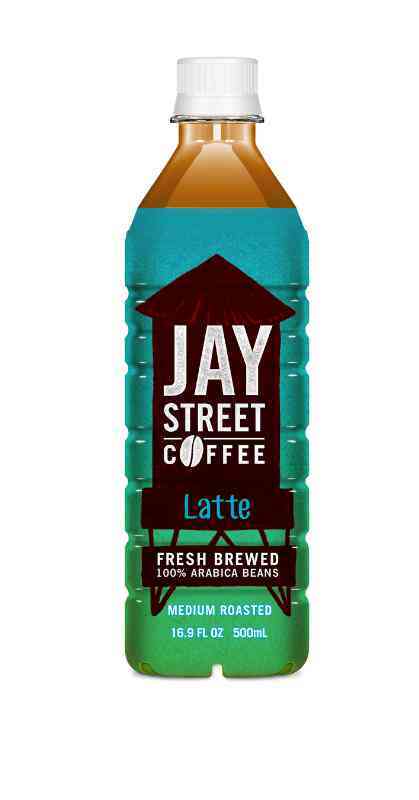 With only 180 calories per bottle, Jay Street Coffee is strong in character, but not overly sweet. The company recently reduced the packaging of their ready-to-drink beverage bottles to 18.7 grams compared to the industry standard of 24 grams. With a lighter gauge bottle and smaller bottle caps, the company is committed to reducing their carbon footprint. Recognized for their environmental initiatives, ITO EN has been awarded for their innovation of eco-friendly products made from recycled used tea leaves. Jay Street Coffee will be available nationwide in specialty and mainstream markets with a suggested retail of $2.49. For more information, please visit Jaystreetcoffee.com or www.itoen.com.